According to the 1969 hit song by Tony Joe White, “Poke Salad Annie,” Annie would go down to the truck patch and pick a mess of poke salad, but unfortunately later in the song a gator eats her Granny. Despite Granny’s bad luck, Pokeweed is an amazing native plant that is an important food source for our birds and should have a place in our wildlife habitats. Pokeweed (Phytolacca Americana), also known as Pokeberry, Pokeroot and Pigeon Berry, is an herb native to New Jersey which grows just about anywhere, from waste areas to any backyard that has birds passing through it. It is a good bet that if you walked out to your backyard or took a stroll down the corner right now that you would find some Pokeweed growing around, in between or next to something in your neighborhood. I first thought it gots its name Pokeweed because it pokes its head everywhere in my backyard, between my milkweeds, in my honeysuckle you name it. But it is okay with me and especially okay with many bird species . Pokeweed gets its name from the Virginia Indian word for the plant — “pokon” — which in turn was derived from the Indian word “pak,” which means blood. Pokeweed has an amazing history and folklore connected to it. Native Americans used it as treatment for everything from joint pain to skin problems and it is said that the juice from the Pokeberry was used for the ink to sign the Declaration of Independence. Today the plant is used in research as a possible cure for leukemia, as an anti-HIV drug, and of course just like Poke Salad Annie it is still eaten like a vegetable, especially in the deep south. Some of my friends still remember being sent out by their parents to pick some Pokeweed. However, all parts of the plant are toxic and should only be prepared properly by those who have experience doing so (less Annie’s Granny). All that being said lets talk about the most important reason not to cut down those strange looking weeds in your yard. Pokeweed is one of the best plants for attracting birds The beautiful but toxic purple berries are eaten by at least 60 different species of birds, including Cedar Waxwings, many Warbler species, Mockingbirds, Woodpeckers, Thrushes, and Grosbeaks, which will all be happy to visit your Pokeweed Patch. Pokeweed is an herbaceous plant that grows from 1-to10 feet tall. Leaves are single alternate, pointed at the end and crinkled. The flowers are white in clusters at the end of branches which later develop into purple berries in late summer. You won’t have to look for this plant at a nursery because the birds will be happy to donate the seeds after they pass through their system. The berries are poisonous to humans but are harmless to the birds. The seeds, which can lay dormant in the soil for a century or more, may begin to germinate when you turn the soil for a new garden. Some experts advise that this plant should not be touched let alone eaten by humans. Although they say that more research needs to be done, it is possible that toxins can be taken in through the skin, in which case I should have passed away about 50 years ago. Obviously there are a lot of myths and folklore attached to the story of Pokeweed, but it is always better to be cautious. I would advise not keeping this plant in your yard with small children, and pets that may consume it, and if you happen to be pregnant get someone else to remove it just to be safe . Pokeweed has an important place in the wild and the backyard habitat. 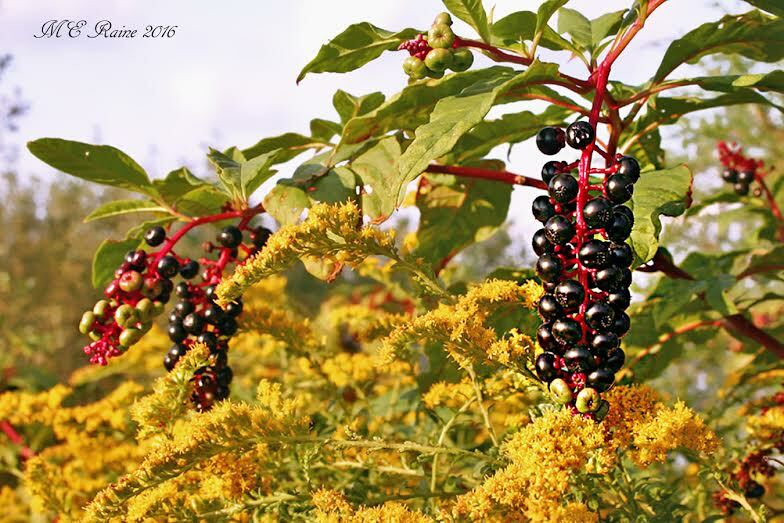 So help the wildlife in your neighborhood, let the Pokeweed grow and count the birds that visit your backyard to feast on this strange but wonderful native plant. Just keep an eye out for your Granny and the Gators! This plant is caustic last year i removed some and put into compost bags. A few weeks later the decomposing plants started oozing and some juices got on my skin it felt like acid on my skin actually burned my skin. really ? I must be immune , it composts fine when i have used it ..interesting..thats why its weird !